Evisa is a picturesque hill village in western Corsica, about 10km inland from Porto, surrounded by forests (the Aitone Forest) and mountains. Evisa itself is pleasant if unremarkable - there is little in the way of historical monuments and the Church of Saint Martin in the center is quite recent. It is for the surrounding scenery and hiking opportunities, and its easy access from Porto, that most visitors are attracted here. 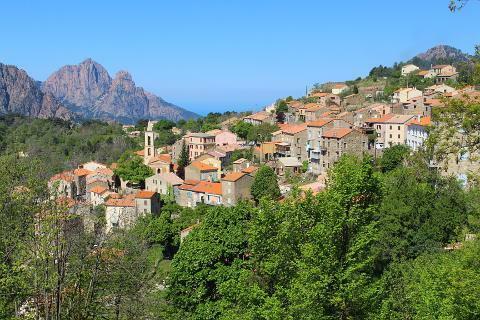 The village stands at the upper end of the Gorges de Spelunca (the village of Ota is the lower end), one of the scenic highlights in this part of Corsica, and a visit to the village will usually form part of a visit to the gorges - or ideally a walk along the gorges between Ota and Evisa. 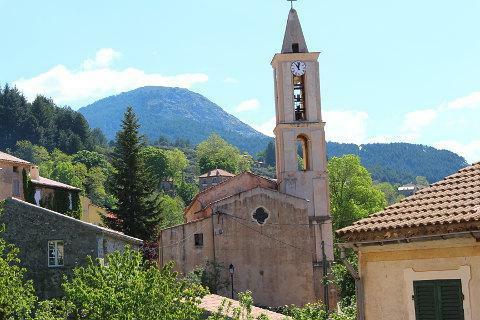 Whilst the village is small it is pretty and views from here over the mountains are stunning. The village hugs the hillside and most of the houses look out onto the rocks on the other side of the gorge. Driving along the road are a number of restaurants and bars all advertising panoramic views. And indeed we stopped at one for a coffee and croissant and the views from the terrace were splendid. 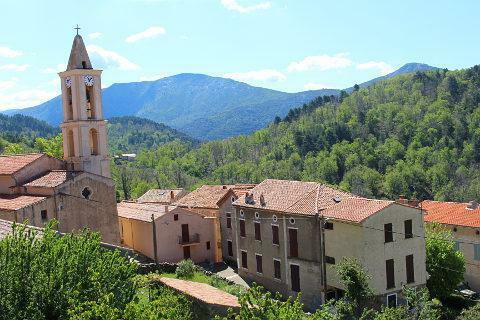 Evisa is surrounded by forested hills and chestnut trees and staying here a couple of days is recommended if you are a hiker - as well as the gorges to the west the lovely scenery of the Aitone Forest is to the east of Evisa. The Foret d'Aitone is home to Corsica's oldest stand of Laricio pines and you can take a walk to these gigantic trees. A popular walk is the 3 hour walk along an old mule trail to Ota. This is part of the Mare e Monti trail (following the west of the mountains). The trail to Ota is a pretty walk in the Spelunca gorge with lots of shade and which passes two Genoese arched bridges of the 15 and 18th centuries. Another long distance trail is the Mare a Mare Nord (coast to coast across central Corsica). We also enjoyed the drive to Evisa which has some stunning views of the gorges and also all along the road we came to groups of cows, goats and wild pigs with piglets! The fabulous Calanches with their gorgeous red cliffs plunging into the sea can be reached from nearby Porto. Another way to visit the Calanches is via the Scandola Nature Reserve. The Gorges de la Restonica are beautiful scenic gorges a short distance south of Corte.